Today I had the chance to finally see Giorgione’s Castelfranco Madonna in person. It is a beautiful painting and it made a real impression on me. It is one of those rare works of art which seem to defy the limitations of the artist’s chosen medium. For the figures of the Madonna and the Child Jesus seemed to me to be completely three-dimensional and even raised above the painting. So masterfully were they painted, it took my eyes a while to see that all the figures and all the details of the composition were on the same flat surface. I couldn’t believe it that we had been to Castelfranco Veneto – a gorgeous medieval walled city and Giorgione’s birthplace – at least half a dozen times before and never had the opportunity to see this painting there. As it happened, all our previous visits had either coincided with the long riposo hours, when the cathedral in which the painting is located remains firmly shut, or we had been there late in the afternoon/early evening in order to experience the local medieval fair or simply to have a coffee and watch the world go by on a balmy spring evening. Today though the stars finally aligned and we found ourselves in Castelfranco Veneto just as the town was coming up from its sweet Sunday slumber. To be completely honest, this afternoon we had planned to go to Venice, but we missed the train by a minute. The next train leaving that we could jump on (even though we still had to run first down and then up some steep steps to reach the platform on time) was the one going to Treviso. Spontaneously, we decided to travel to Castelfranco Veneto which is on the same train line and about 40 minutes away from Vicenza. For its mouthful of a name, the town is rather tiny, with one of the neatest and most gorgeous historical centres I have had the pleasure to experience. Surrounded completely by a tall defensive wall, it is a gem of a place and, as luck would have it, this year’s edition of its medieval fair started yesterday, so today the atmosphere was lively and happy, with people enjoying being out and about with their families. 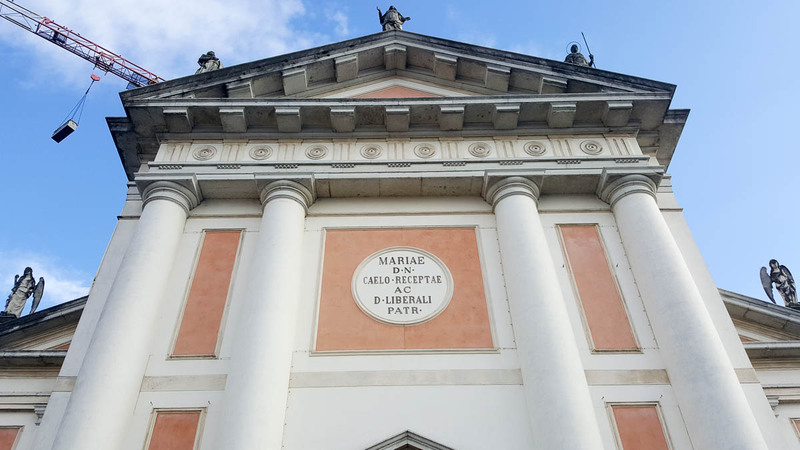 After a compulsory gelato, we headed to Castelfranco Veneto’s 18th-century cathedral – a pretty as a picture building with a facade with salmon panels which you will find in the heart of the community. I was rather surprised by how bare it looked on the inside. I expected ornate decorations, a multitude of paintings, elaborate pillars. In contrast, it was white, streamlined and with some very high ceilings. It was very peaceful. We had a look around, trying to keep our steps as quiet as possible so as not to interfere with the silence. A male choir soon started singing adding to the atmosphere. We stopped in front of a statue of the Madonna – in bright colours, with stars around her head and with her feet firmly pressing down on a snake. Just further down from it was a lovely painting of St. Catherine in front of which people had left bags with food and clothes as donations for the less advantaged. A 16th-century fresco of St. Anthony followed and then we saw the entrance to a small chapel inside which was Giorgione’s Castelfranco Madonna. The full name of the painting is ‘The Madonna and Child between St. Francis and St. Nicasius’. It is an altarpiece which depicts the Madonna sitting on an unusually high throne and holding the Child Jesus with her right hand. In the lower part of the foreground are the figures of St. Francis to the right and of the martyred St. Nicasius to the left. The former is dressed in a habit and the latter – in full armour. 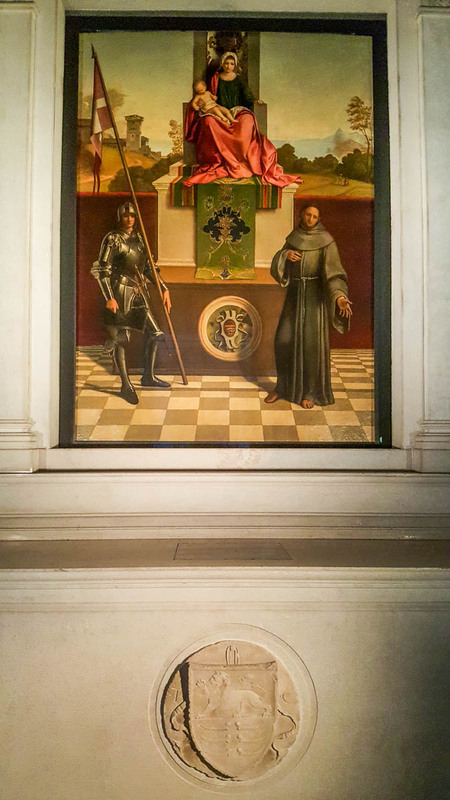 It is curious to note that while it had always been easy to identify St. Francis in the painting, the identity of the other saint was a debatable topic for some time. At different stages it was thought that he was either St. George (in direct reference to Giorgione), San Liberal (patron of the church at the place of which Castelfranco’s cathedral was buil in 1724 and also patron of the city of Treviso), St. Florian (revered in Austria and High Veneto) and, finally, St Nicasius (a martyr who was a member of the Order of the Knights Hospitaller and was particularly revered in Messina). In the background is the town of Castelfranco Veneto with its towers and beautiful views towards the nearby mountains. Giorgione is, undoubtedly, Castelfranco’s most famous and most feted son. Yet, very little is known of the painter who is believed to have been either a teacher or a close friend to Titian, who developed the technique of ‘painting without drawing’ and who passed away at 33 years of age most probably as a victim of the plague which had taken over Venice in 1510. There are very few preserved to our days documents referencing Giorgione and only a few works of art can be attributed to him without any doubts. One of them is the Castelfranco Madonna which was commissioned to Giorgione by the Captain Tuzio Costanzo for his family chapel at the Church of San Liberal. Originally from Messina, Tuzio had moved to Castelfranco Veneto in 1475 after having served Catherine Cornaro – the Queen of Cyprus – and thus earning himself the title of Viceroy. He was also a member of the Knights Hospitaller. With the painting Tuzio wanted to celebrate his family and, particularly, his son Matteo who had perished in 1499 in Ravenna during the War of Casentino. 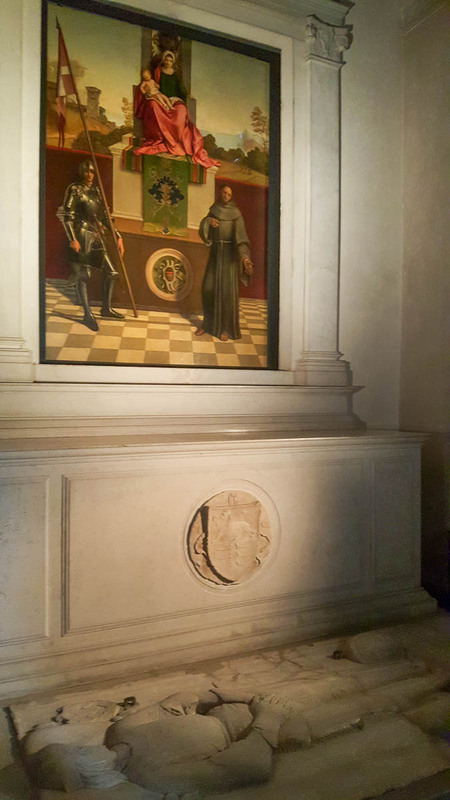 In fact, the tombstone which nowadays is at the foot of the altarpiece is that of Matteo. 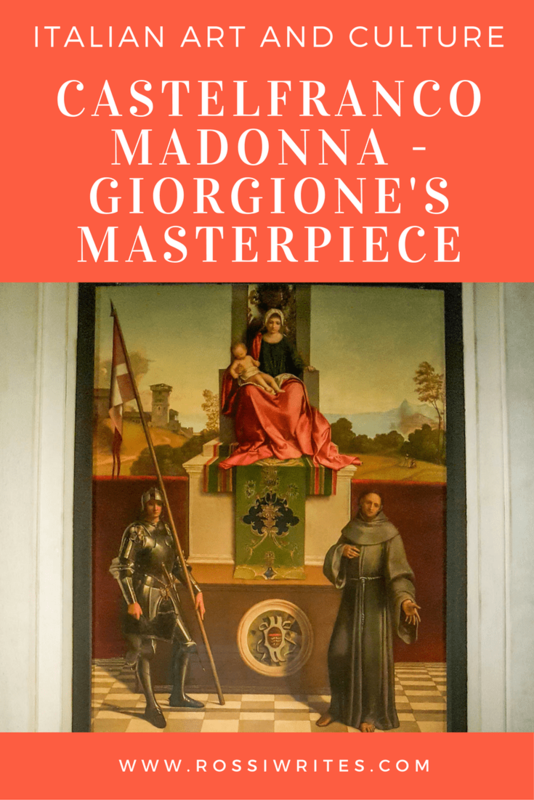 He died whilst Giorgione was still working on the painting, which led Tuzio to ask the painter to change his plans and to include a porphyry sarcophagus at the base of the Madonna’s throne. The sadness of the Virgin is also a direct reference to the suffering of the father whose son had passed away at only 23 years of age. 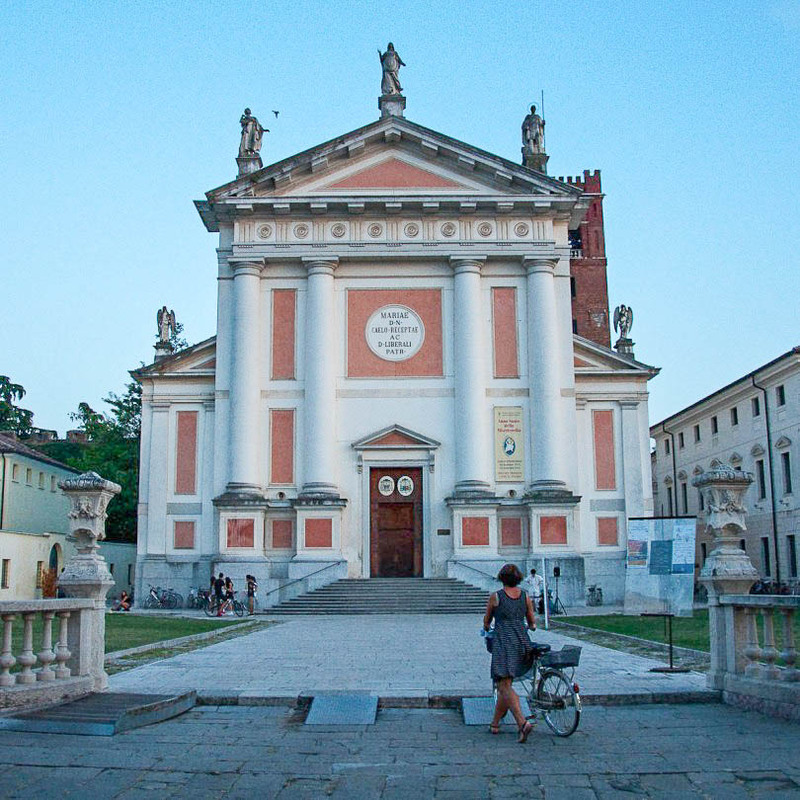 The painting was then placed at the altar of Tuzio’s family chapel in the Church of San Liberal in Castelfranco Veneto. On both sides of the altar and built in the wall were the tombs of Tuzio and Matteo – father and son. The church was later demolished and in 1724 the Castelfranco Cathedral was erected in its place, where it stands to this day. 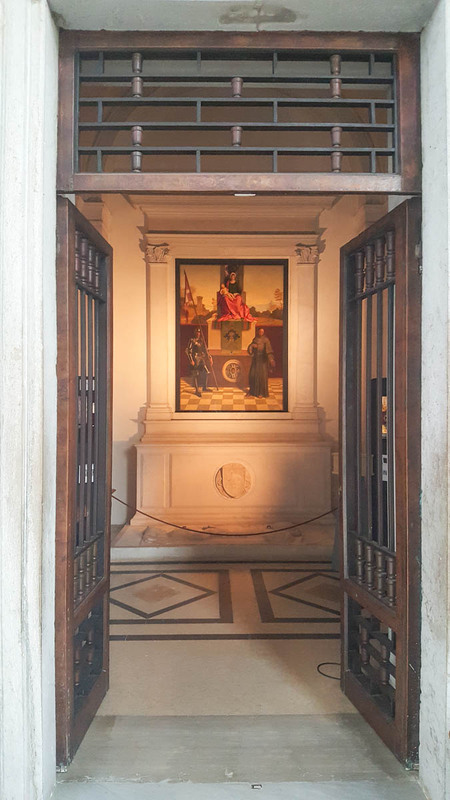 A chapel was specifically built in it to house Giorgione’s Madonna and Matteo’s tomb at her feet. The painting was stolen in 1972 and once it was recovered, it underwent a long process of restoration which dealt with the damage it had suffered during earlier clumsy attempts at restoring it. In 2005 it was returned to Castelfranco Veneto where it can be seen today. If you find yourself in this beautiful little town, don’t miss the experience. It is very special, you truly know that you are in the presence of a masterpiece. It is not like when you are at a museum and you see so many paintings that they all become one big blur figuratively burning your eyes. It is an intimate, quite the meditative experience to walk into the small chapel of the large cathedral and spend some time admiring the masterful depiction of the figures, the rich folds of the Madonna’s red velvet cloak, the armour of St. Nicasius, the poetic landscape and many other small and big details. The cathedral is open for visitors between 9 and 12 am and then between 15 and 18 pm. Visitors are not allowed during mass. Right next door to the cathedral stands Giorgione’s House. There you can admire the second work of art which the painter left to his hometown – the impressive Frieze of the Liberal and Mechanical Arts. I will tell you more about it though in a separate blog post.